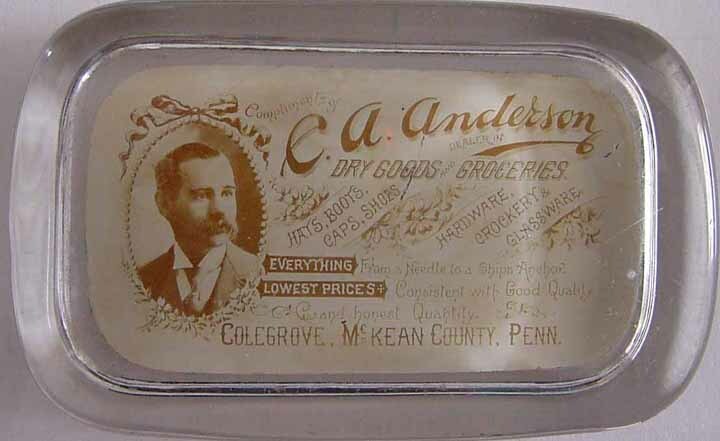 C. A. Anderson was born in Warberg, Sweden, March 5, 1860, a son or Andrew and Iuga Anderson. He attended school in his native country, when his father having moved to the United States, he was anxious to come and find him, but having no money he borrowed enough of a friend to pay his passage to New York City. From New York he went to New Jersey, where he was employed two months in carrying water to a company of men working on a railroad. Having earned a little money, he determined to come to McKean county. He landed at Ridgway, a small boy without friends or money, and unable to speak the English language. Here a gentleman gave him money enough to take him to Wilcox, thirteen miles away, and from there he walked to Clermont, where he found some of his own county people, to whom he told his story. 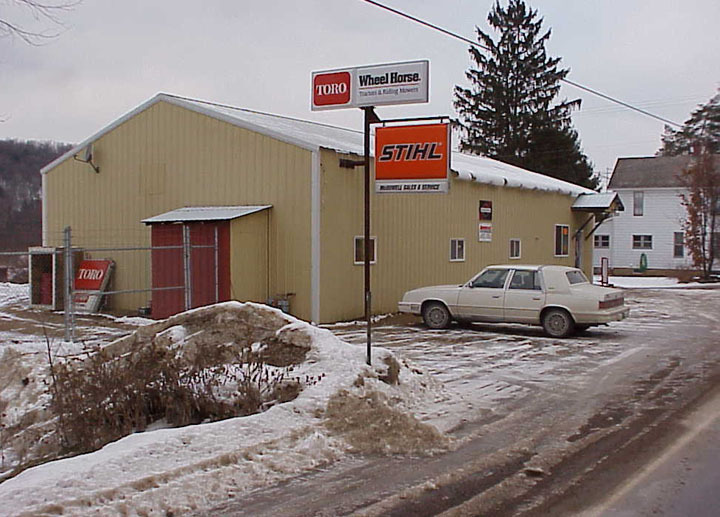 They furnished him with food and money enough to take him to his father in Smethport. He found his father, who was not able, however, to support him, and a Mrs. Rifle furnished him with a room and a bed, and he worked at anything he could find to obtain his food. After spending a week in Smethport he accompanied his father to Colegrove, where the latter was employed by W. J. Colegrove, and e worked for his board. His father left Mr. Colegrove in about two months, but he continued in his employ, remaining on his farm until 1881, when he was employed as clerk in the general store of W. J. Colegrove & Son at Colegrove. This partnership was dissolved, and C. M. Colegrove carried on the business until July 19, 1883, when he sold out to Mr. Anderson, who, after a few months, admitted M. J. Gallup as partner in the business, and they continued together until April 1, 1886, when Mr. Anderson bought Mr. Gallup's interest and has since continued the business alone. 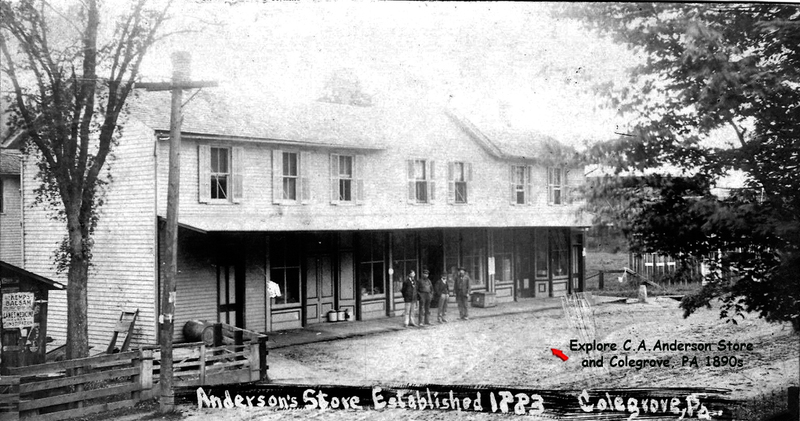 Mr. Anderson had been a successful business man, and was highly esteemed in the town of Colegrove. He had held various township offices and August 1, 1883 was appointed postmaster. 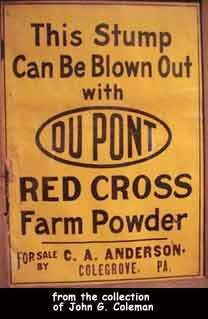 He was married April 25, 1887, to Miss Annie, daughter of Conrad and Lena Bayer, of Norwich township. Mr. Anderson was a member of Norwich Lodge, No. 538, E. A. U., and McKean Lodge, No. 388, F. & A. M. He and his wife were also members of the Methodist Episcopal Church. 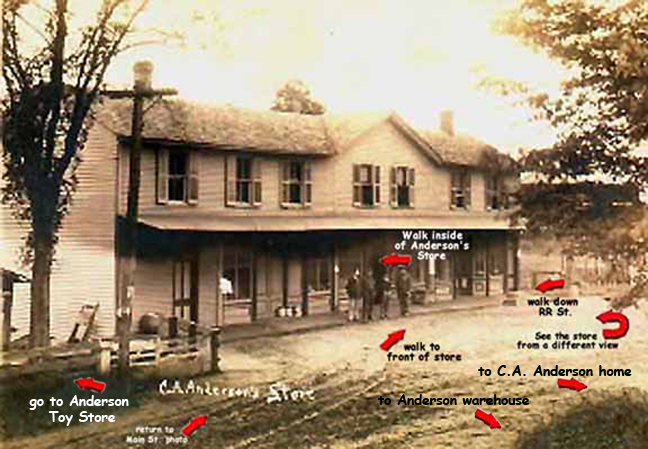 Below is a souvenir from Anderson's Store showing some of the products that were sold at his store.